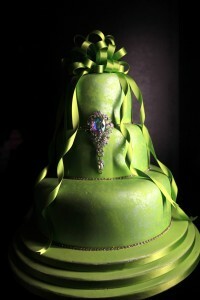 Before I saw today’s wedding cake I will admit that I never once thought about green as a wedding cake color. But this cake – courtesy of Hockleys Cakes – has me singing a different tune! I absolutely love this emerald green cake. 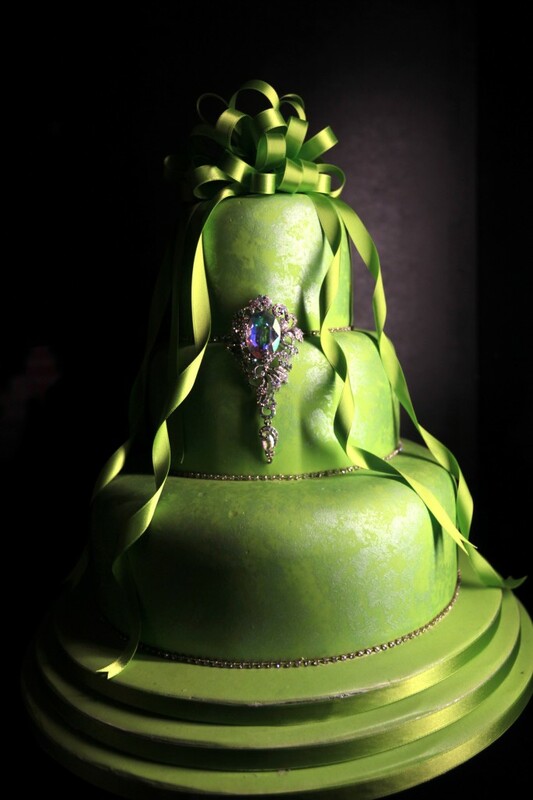 It is so stunning and so unique and will leave other cakes “green” with envy! And it isn’t just the green color of the cake that has me saying WOW – it’s that brooch. Seriously that is just downright incredible. And stunning. And it adds to the rich look and feel of the cake. Michael Hockley – from Hockleys Cakes – said the inspiration for this creation was a bride and groom who wanted a bit of “bling” for their wedding cake. The cake’s emerald royal icing has a subtle silver covering (look closely, you’ll see it). And diamante beads are featured around the base of each tier, giving it some added sparkle. And then there’s that Victorian-style diamond brooch and the cascading ribbon. This cake really is all bling yet it’s subtle and not in-your-face. And it’s gorgeous. I want to thank Hockleys Cakes for sharing this creation with us! Check back again next week when I’ll feature another one of their amazing creations. Emerald Ribbon and Diamond Brooch Wedding Cake.